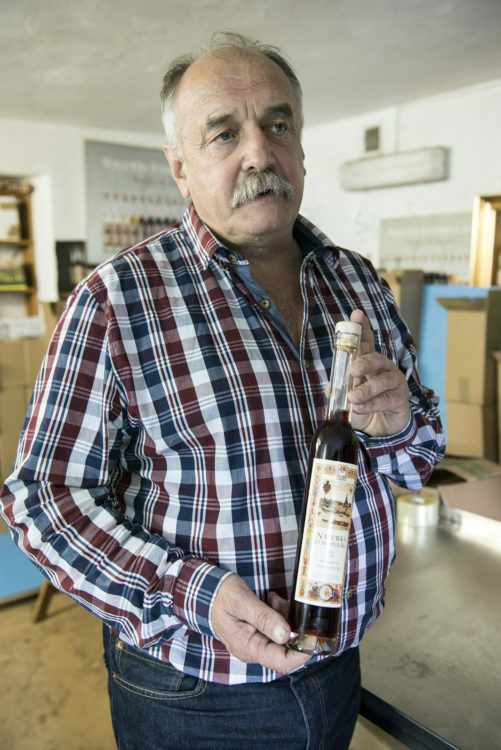 Poland’s beloved herb and fruit liqueur, once the ambit of women brewers only, has been made famous by a man operating from his family’s garden. For Roads & Kingdoms, August 2016. The garden is resplendent in the glow of autumn. 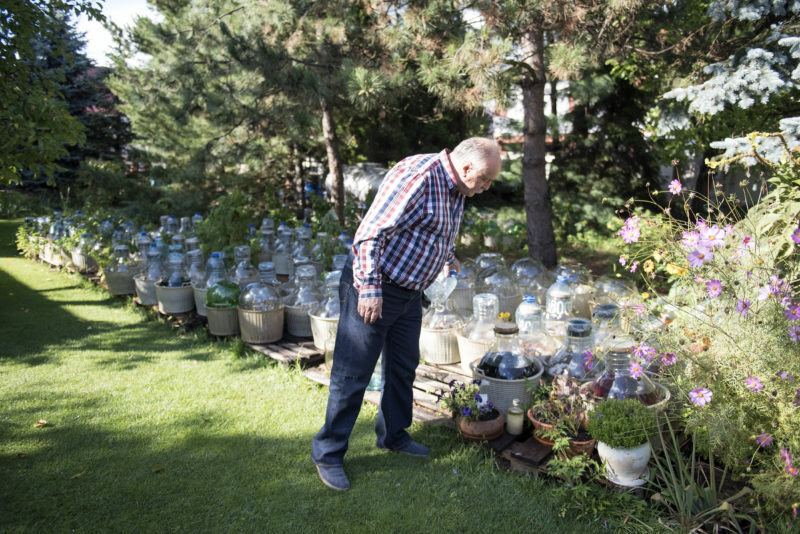 Thirty minutes outside Warsaw central, Karol Majewski, widely regarded the country’s top small-batch nalewka manufacturer is showing me around the production plant. 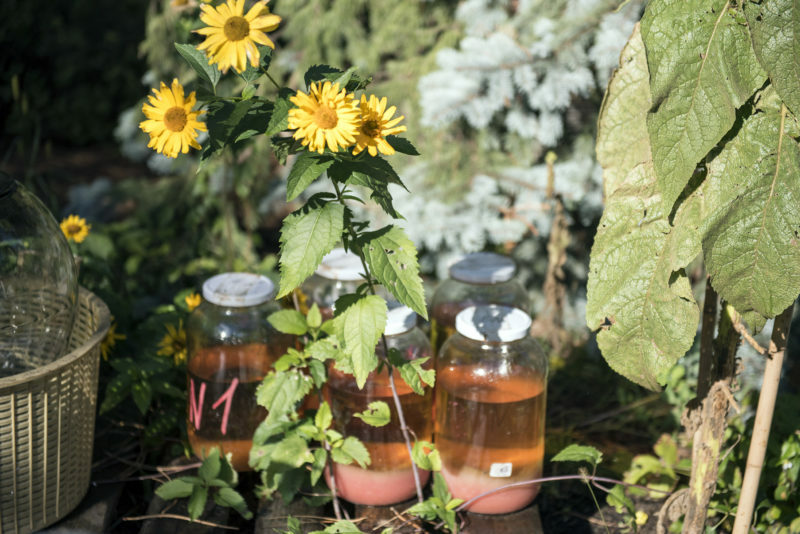 And this is it – the compact, tidy suburban garden, with clusters of berries ripening on branches, bright yellow blooms and fat glass jars of percolating nalewki soaking up the sun’s warmth. 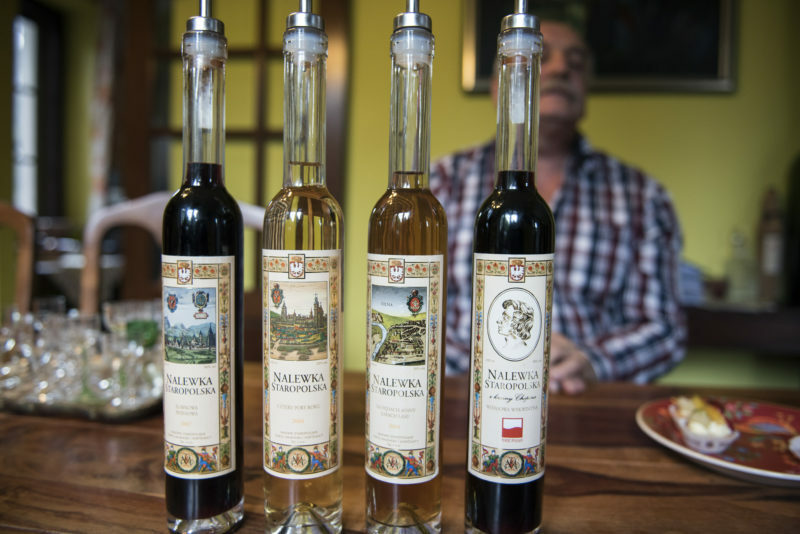 The entire process of brewing Poland’s famed fruit and herbal liqueur, the artisanal sort that Majewski has become famous for, happens right here. 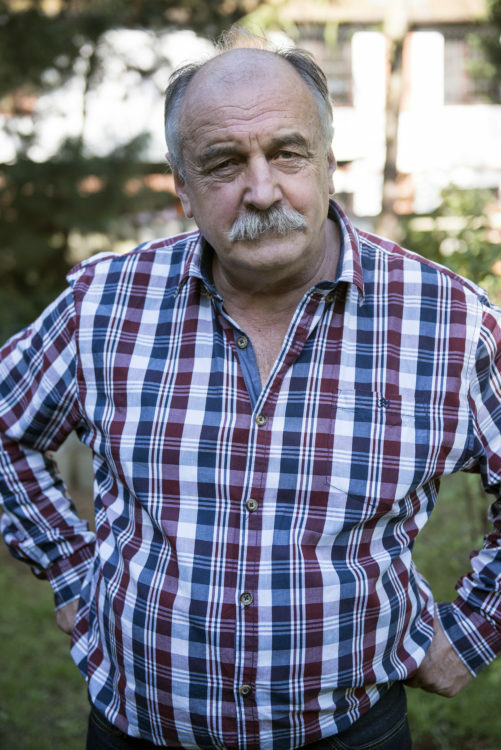 His hefty walrus moustache lifts as his eyes crinkle in a smile at my surprise that the few meters we’ve walked cover the extent of the famous Nalewki Staropolskie empire. The staff consists of Majewski, his wife and their two daughters. He laughs and smacks his chest gently, “I am. Here, I control everything. I never let a bad bottle go there,” he gestures outwards, to the world beyond his. There’s an ancient wooden table on which just-picked berries rest before being sorted, as do the fir-tree twigs he harvests nearby for his forest nalewka. In a room adjacent to the garden, cool and packed to the rafters, skinny bottles sit awaiting labels. Majewski’s nalewki take roughly three years to mature from the start of the process. Every Polish family has their secret recipe for nalewka, I’m told. It’s the age-old combination of alcohol, sugar and seasonal fruit and berries or herbs and spices. And time. The nation shares a joke that nalewka is widely considered medicinal, a digestive. “And we are a self-medicating nation,” Majewski booms. For many families, brewing nalewka is seen as women’s work, or at least it was, Majewski says. He comes from a line of legendary women nalewka makers. “In my case, I was just one of those exceptions,” he adds. At the dining room table Majewski brings out a tray of delicate glasses. Some have been in the family since the 30s, treasures they’ve held onto, much like their nalewka-brewing secrets. 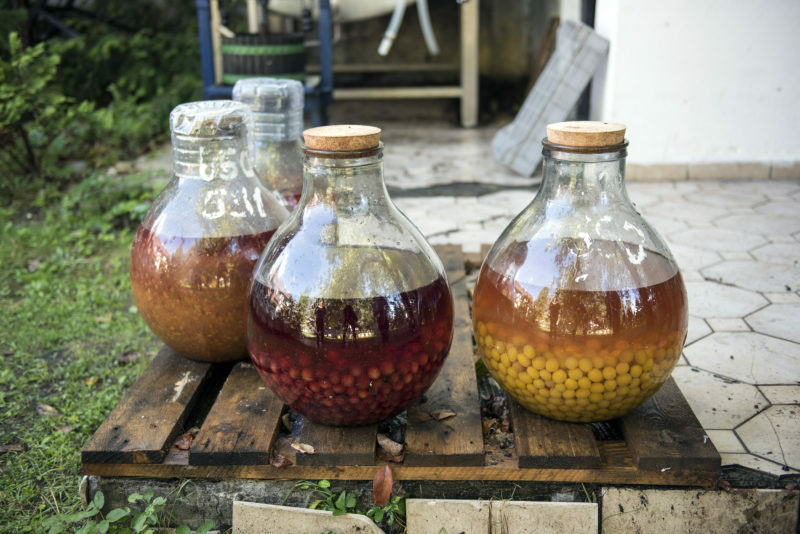 “It used to be a special honour to be treated with a glass of nalewka, so you were always presented with a small glass, and it was a high-quality one,” he says, pouring a pale yellow-colored nalewka. It’s undoubtedly lemon. There’s a secret ingredient, and he wants me to guess. I drain the glass slowly and contemplate telling him that I know the answer – I’ve played this friendly charade at Atelier Amaro, the country’s only Michelin-starred restaurant. It’s milk with a 3.8 per cent fat content. I feign surprise, and Majewski is pleased. Between 2014 and 2015 there was only one person who guessed correctly – a French chef with three Michelin stars under his belt. Then Majewski pours a smoked plum and cherry nalewka, his signature brew. Nalewki glasses clutter the table as the afternoon sun dips behind the horizon.